January 26, 1962. 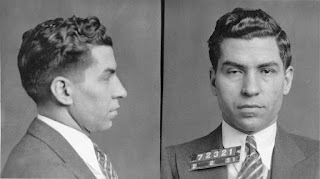 Charles 'Lucky' Luciano suffers fatal heart attack. Having just endured yet another session of police interrogation (this time was about a drug ring), Lucky Luciano was exhausted but determined to keep a scheduled meeting with would-be biopic producer Martin Gosch. The latter was arriving from Spain, where he'd taken up a home-away-from-home in the late 1950's. Gosch had been meeting with Luciano periodically since at least 1960. Both wanted a movie made, although Lucky and movie producers historically had great differences of opinion in storyline. The pair did in fact meet at the Capodichino airport in Naples on January 26, 1962. Gosch's plane arrived just after 4:00 pm, and he was greeted by Lucky and an English-speaking police officer named Cesare Resta (Luciano invited Resta to help prove he was not making drug deals). Inside, Lucky sipped on a fruit drink, chatting with Gosch. Shortly after 5:00 pm, as they were walking toward Lucky's car in the parking lot, the aging gangster stumbled, uttering the last words, "Martin, Martin." Gosch knew Lucky had a heart condition, but it was too late (when onlookers saw the producer trying to place a pill in the fallen man's mouth the foundation for conspiracy theories was inadvertently laid). The airport's on-staff physician arrived, placed a stethoscope to Luciano's chest, then clearly stated the finality of situation, albeit in a laconic, matter-of-fact way - "This man is dead." Prior the the official autopsy report, rumors of 'poisoning' were published. 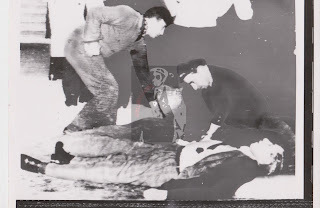 Once the autopsy was revealed to the public (months later) it showed the true non-dramatic reality... Lucky Luciano had a bad heart and that bad heart gave out.. Still, there continued to be whispers of assassination, carried out to silence the once great mob boss ( be it for the proposed movie, or his alleged drug ring). Despite the media misreporting, conspiracies, and - even if it was true - the 'International Drug Ring' implications that dogged him for decades... Lucky Luciano got to have his day, because soon he would be going home. 1962, Naples Italy. Mourners pay last respects to Lucky Luciano at the Cemetery of Poggioreale. "No solemn funeral service can be celebrated for someone who lives in 'obvious concubinage'." - Don Guido San Martino, officiating priest of the Most Holy Trinity Church of St. Joachim. On January 29th, Don Guido San Martino, priest of the Most Holy Trinity Church of St. Joachim, gave requiem mass for Luciano. The priest publicly stated the mass would be "without special pomp" and he felt great discomfort knowing the deceased party's 'live-in' relationship with twenty-four year old Adriana Risso (sometimes identified as Rizzo). As for the whole 'gangster' element, the priest apparently wasn't quite as concerned, stating the service was - "For his soul and has nothing to do with what his life may have been." Well, the service contradicted the priest's plans, yet surely unfolded just as the hordes of cops (American and Italian, plainclothes and uniform) expected. There was pushing, shoving and verbal threats, mostly all aimed at the estimated one-hundred and fifty reporters present. Among those in attendance who were not press or police: Lucky's brother Bartolo, nephew Salvatore, girlfriend Adriana Risso, a few American wiseguys, and although confined by law to remain in the town of Avellino's borders, another deported gangster/friend, Joe Adonis, sent a wreath adorn with the phrase, "So Long Pal." "Be quiet or I warn you I am going to knock someone on the head." 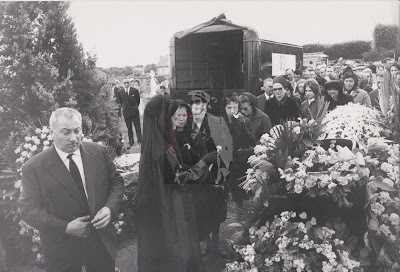 - Unidentified elderly mourner threatening a photographer. Luciano's mahogany casket left the church in an ornate hearse pulled by eight horses. Brother Bartolo had been trying secure permission to bring Lucky's remains back to New York for burial in the family mausoleum, so in the interim the casket would be kept in the chapel of the Cemetery of Poggioreale. On February 7th, 1962, Salvatore 'Charlie Lucky Luciano' Lucania officially came home. Without any religious service this time, Luciano reached his final resting place - St. John's Cemetery in Queens, New York. He purchased the mausoleum in 1935 (reports of the pricetag vary in range from $25,000 and $30,000), and was designed with capacity for up to sixteen coffins. Bartolo Lucania evicted Adriana Risso from Lucky's apartment. The official autopsy report was released that June, debunking the 'poison' theories. Cameron Mitchell, the American actor who agreed to play the role of Lucky in Gosch's planned movie production, received multiple death threats, presumed to be from Italian Mafia. Gosch was actually working for producer Barnett Glassmen, according to a 1975 New York Times 'Letter to the Editor.' The letter further claims Luciano didn't particularly like Gosch and basically discussed a 'fictional' story, not memoir. Adriana Risso, Lucky's last love interest, was one of five beneficiaries listed to receive royalties from the book's sales. Tension Marks Lucky's Funeral. Reuters. New York Post, January 29, 1962, p. 20. Luciano's Funeral is Today. AP. The Kingston Daily Freeman, January 1962, p. 1. Cipollini, Christian. Lucky Luciano: Mysterious Tales of a Gangland Legend, Strategic Media Books, 2014. Summers, Anthony & Robbyn Swan. Sinatra: The Life, Vintage, 2006. Scaduto, Tony. Letter to the Editor. New York Times. 27 April 1975.